One of the many criticisms of soccer is that it is boring and there is no scoring. No one said that about the match between the New England Revolution and Real Salt Lake. This game had it all. Fans were treated to red cards, goals, referee mistakes, crossbars and player scuffles. When it comes to selling the game, consider this a prime candidate for replay. In the opening three minutes of play Nat Borchers received an extremely questionable red card for a supposed foul on Benny Feilhaber. Replays showed the play to be almost nothing. As if the red card wasn’t enough the subsequent PK was buried and less than twenty minutes later Chris Tierney blasted home a free kick to put New England up 2-0. Despite being a man and two goals down, Real Salt Lake pushed on and controlled the midfield. In fact, it looked as though they were the ones with an extra man. RSL moved the ball well and were rewarded for their composure in the 24th minute when Will Johnson knocked home a close range shot to cut the Revolution lead in half. After haltime it still looked like the game was there for RSL to take and in the 53rd minute, Ned Grabavoy drew a foul by Ryan Cochrane to earn a penalty kick. Alvaro Saborio buried the PK and suddenly the game was tied 2-2. The drama was far from over as even the coaches were having words. 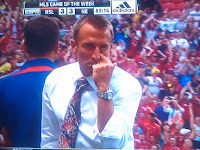 Several times throughout the game Jason Kreis and Steve Nicol could be seen jarring at one another. Entertaining to say the least. New England took the lead again in the 63rd after Jamison Olave failed to mark Shalrie Joseph on a free kick and Joseph headed it home. The goal was completely against the run of play. Not four minutes later, Ryan Cochrane picked up his second yellow and the game saw its second ejection. Real Salt Lake continued to press the issue and in the 83rd minute RSL fans were treated to a Fabian Espindola goal to tie the game. It was there that the game would end with a score of 3-3. When his team was winning, Steve Nicol removed defender Darrius Barnes from the game. 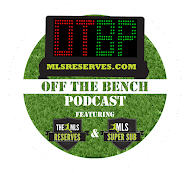 Barnes absence was noticed and RSL took advantage of the depleted back line for New England. Barnes has been solid all night and it was likely his absence that contributed to the Revolutions failure to hold the lead. The Revs lacked a stable center back and it showed on Espindola's goal. Controversy ruled the day with two penalty kicks, two red cards, six goals and several questionable calls throughout. 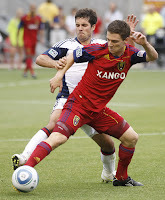 However, it was because of RSL’s perseverance that they were able to take a point on the night. Replays showed the team being hard done by several referee decisions and rather than capitulate and fall to circumstance, they took the game into their own hands and kept on pushing.